"One day Soga no Gorō fell asleep and dreamed that his brother, Jūrō, was in great danger. He flung on armour, commandeered a horse, seized a radish for a whip and galloped to the coastal town of Ōiso. Jūrō was attending a banquet at the mansion of a feudal lord named Wada, together with the brothers' sworn enemy, Kudō /Suketsune. When he arrived, Gorō saw that his brother was in no immediate danger. However, realizing their enemy was indeed present, he rushed towards the banqueting hall to carry out their revenge, an act that would have violated the unwritten feudal etiquette of vengeance. Fortunately, Gorō was stopped at the door by Kobayashi Asaina (or Asahina), one of his enemy's retainers, who was secretly sympathetic to the boys' cause. Asaina seized the skirts of Gorō's amour as the youth pushed past and the two had a fierce tug-of-war, which ended in an impasse. 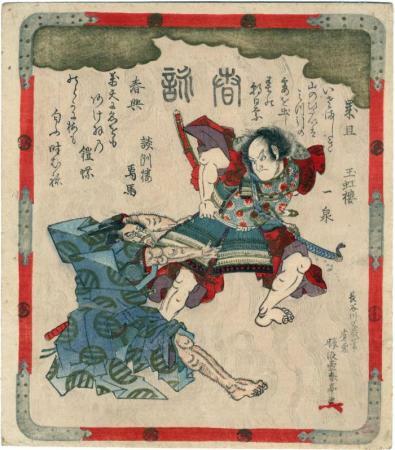 The scene, which is called kusazuribiki, 'armour-pulling', is extremely popular in the kabuki theatre and has been the subject of many woodblock prints. Shuntei's surimono is designed as a copy of a framed votive painting of this scene. It bears a second signature of Hasegawa Kyuzō (1568-93), a son and pupil of the great sixteenth-century classical painter Hasegawa Tōhaku. No familiar tradition links Kyuzō or the Hasegawa painters of Kyōto with ukiyo-e and the picture is drawn in an early eighteenth-century Torii style. One can only guess that Shuntei, or one of his commissioning patrons, was confused; or that someone was trying to create evidence for an alternative source of the ukiyo-e style. The two archaic characters in seal script in the centre of the picture read shunei, 'spring poems'. The poems are titled saitan and shunkyō, 'New Year' and 'spring verse'. In the first are puns on asahi, 'morning sun', and the name Asaina. Mizuhiki are the red and white bands on the skirts of armour. The second poem includes Gorō's emblem, the butterfly, and puns on toki, 'time', and Tokimune, his personal name. Quoted from: The Art of surimono: Privately published Japanese woodblock prints and books in the Chester Beatty Library, Dublin by Roger Keyes, vol. 2, p. 375.